Striking lime-green flowers make a design statement. 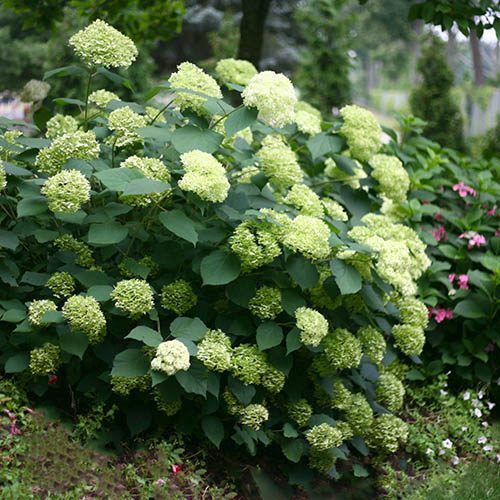 Large, domed flowerheads of palest green cover this must-have shrub all through the summer. Transitioning from fresh lime-green to white as the season progresses, the blooms create a stunning contrast to the luxurious, dark green leaves. Fabulous as cut flowers in both fresh and dried arrangements and are also amazing when left on the plants over winter. An easy-to-grow hydrangea which is happy in sun or partial shade and makes a particularly striking plant for a container - either on its own or with purple perennials such as salvias. Impress your friends and neighbours by adding this unusual lime-green flowered hydrangea into your summer planting schemes. Full of designer style, Hydrangea ‘Lime Rickey’ is one of those shrubs that no garden should be without - the large, domed flowerheads of palest green cover this trendy, must-have shrub all through summer, creating a stunning contrast to its luxurious, dark green leaves. Transitioning from fresh lime-green in midsummer to white as the season progresses, the long-lasting blooms make fabulous cut flowers in both fresh and dried arrangements and are also amazing when left on the plants over winter, where their skeletal forms create beautiful architectural shapes when covered in frost. Also known as the smooth hydrangea, wild hydrangea, or sevenbark, ‘Lime Rickey’ is a cool-coloured specimen plant which creates a striking contrast to rich purples or fiery reds. Easy-to-grow this hydrangea is happy in sun or partial shade and makes a particularly striking plant for a container - either on its own or with other perennials such as salvias. Grows to aproxomately 1.2m, Hydrangea arborescens 'Lime Rickey' is supplied as an established plant in a 3L pot. Prefers compost-enriched soil that stays moist. Once established, remove a quarter to a third of the shoots to the base of the plant.